"Here it is Senpai! My first report! Would you read it over for me?" Milly asks. Meryl frowns, "What's this doodle you did on the first page?" "Oh," Milly says with a grin, "That's a comic about one of the Vashs. Isn't it just funny?" "Uh... Yeah..." Meryl replies, setting it to the side, "Why don't we just keep it and put it in your scrap book? I don't think the boss needs to see it." Vash the Stampede headed into the little town of Rosemont today. This report is submitted without my senpai Meryl Stryfe who is visiting her father this weekend and has left me to trail the subject on my own. 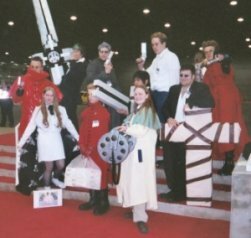 The following report are my observations on the Humanoid Typhoon during a convention that is held in Rosemont every year where people dress up like different characters from their favorite books and act like completely different people. 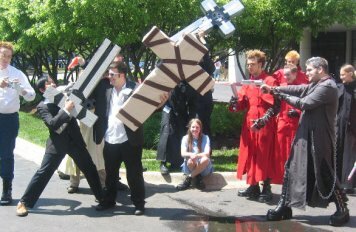 Senpai figures that Mr. Vash comes to this town so he can blend in, although, from what I have seen this weekend, even when everyone is dressed up in outrageous costumes, he still stands out like a sore thumb! The first day of the convention I checked into the hotel room with my new temporary partner Susan Wiese, she's actually a senior partner and is really experienced in field work. I was surprised at how devoted to her job she was! 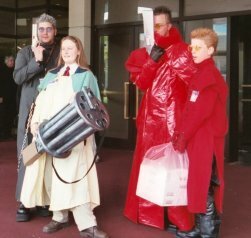 We headed to the main convention center and the big crowds and found Vash within the first hour! (Meryl and I can spend two days in a town before we run into him!) And immediately we set our sights on keeping tabs on him. Actually, it was quite difficult keeping tabs on Vash. There are so many people dressed up like him! I think it's because of the comics that have been written about Mr. Vash recently. People all over Gunsmoke know that he's a blond man with a red coat, and except for me and my superiors at Bernadelli, I doubt anyone really knows who the real Vash is. Even I was fooled for a time! (But don't tell Meryl!!) The womanizing Vash that I ran into last year turned out to be a fake - and there were about ten others I would run into from time to time until my head spun!! This year was nearly as bad!! And they are all so handsome! EEEK! Luckily for me, Susan kept me in line and we were able to sort through which of the Vashs was the real one! *whew* And I was able to keep tabs on him through the weekend. The only problem is, my eyes would get drawn to the red coats! At one point one of the fakes saw us coming and took off like greased lightning up the stairs and fell on his face! It was so hilarious! 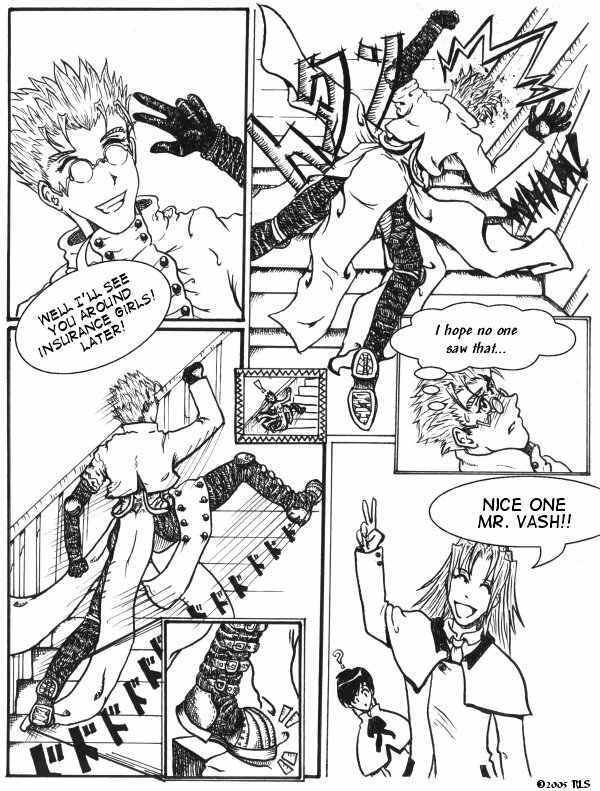 ^_^ I doubt the real Vash would have made such a mistake - then again... We have seen Mr. Vash's clumsy side from time to time... So maybe it really was him! Oh dear! I think I'm getting a headache trying to sort them all out!! They're all starting to look the same! Someone even had the idea to do a Quick Draw tournament! EEK! It was so crazy that after I got in a few shots with my stungun I ran for the hills to find Susan! It was crazy, there were cross punishers and long colts and all sorts of weapons being fired off until my ears rang! I was so glad to get out of there right away! The real Vash wasn't even there anyway! I was pretty disappointed that he didn't show up - but I guess even he would want to stay out of the madness of something like that! Later that night however I went out on my own to see if I could find a bar (not to drink myself! Just to find Mr. Vash since he has a penchant for liquor... Okay, so maybe I would have gotten something to drink... But I think my boss would have been angry with me drinking on the job so I didn't, I swear!) I tracked one of the Vashs into the Soap Bubble thinking he was the real Vash, only to chase him out again as he stole someone's bag! Oh no! I'll have to write a report on it if they're insured by Bernadelli! That Vash was using his good looks for thievery! That's not the real Vash! Thoroughly disappointed I'd followed the wrong one, I headed back to the hotel room when I found a Vash carrying a tray full of donuts (see image above for reference) - he seemed mighty pleased with himself too! But he wouldn't share the donuts! A bit disappointed that we'd lost Mr. Vash, we sat around the lobby of the Hyatt Hotel watching, just in case he were to show up. And then... through the front doors, came the real deal! At least, I think he was the real Vash! Although he looked a bit different from before, I was pretty sure it was him! Vash wandered in through the front doors as if he were on a mission and I got up and left Susan with her coffee to see if I could get a good look at his face - was it really him? I'd know it by the mole on his left cheek (that's one little clue no one spreads in the reports) - and I came up to him and asked him to turn around, but he didn't hear me, so I walked around him, but he turned again!! I nearly grabbed him to turn him around, but finally he stopped moving and I got in front of him and there it was, the mole! This was the REAL deal! (I think) He disappeared shortly afterwards... Susan and I hot on his tail! This time we weren't going to lose him!! And so ended our escursion through the Anime Central convention this year. Meryl joined me outside of town and Susan returned to the little town of Lincoln where her office is. I sure hope I'll be able to work with her again someday! It was really fun! ^_^ We met so many interesting people and saw so many interesting things! "Meryl, so, how was it for my first report?" Meryl scratches her head as she sets it down on the table. "Um, I think when Keane said my reports weren't fit to be printed in dime novels... I think he would have forgiven me if he'd had this to compare it with." "Oh! Do you really think mine could be compared with yours?" Milly clasps her hands together, "That's such a compliment!" "I didn't... Oh nevermind," Meryl says. "Just let me write the reports from now on, okay?" For more Cosplay photos from this convention and other conventions check out my Cosplay.com account - HERE! Some of the images on this page are from Eurobeat King - please visit his page on www.cosplay.com for more details.